We interrupt(ed) this blog to have holidays and focus a bit on some big big family projects. Since this is exactly what the SF Daddy blog is about, it’s a bit out of place to ignore it and not share but there you go. Sometimes, you just go with it. This is the first project that interrupted our flow will my blogging pals. Perhaps we’re back for a while. We’ll just hope so and leave it there. What did we do? Go back to November. While I was working on my novel for NaNoWriMo, we started an a school project for Red1 on Jim Henson. It turns out that she wanted to write a paper and make a video. I’m a fultime video editor for a cable network, so this is right in my ballpark. I coached her in how to write up her script and make notes for when she’s on camera. We did this very low tech of course, but the results were very fun. 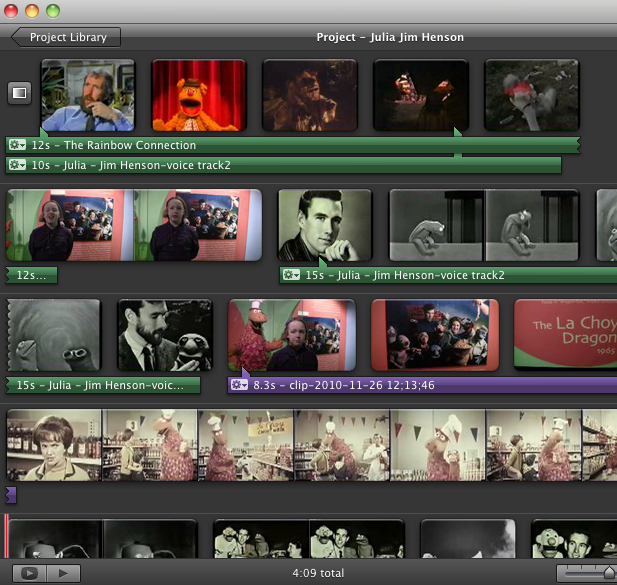 We started reviewing available clips from YouTube to make the selection process simple. I called The Center for Puppetry Arts in Atlanta and asked if we could have permission to video tape some of the exhibits and Red1 in the space for the project and they were very hospitable. We made an appointment and off we went. It pains me as a professional to show up with a home camera, no lights, or a microphone, but as I said, we’re going low tech. I let her call the shots and with only a few nudges of direction, she did a pretty good job. We are talking forth grade, but this fourth grader is like no other. When we got home we started looking at all the footage and she pieced the video together with iMovie herself, which is no small feat. This is a repeat performance. Last year we also did a similar project on King Tut, but that’s a story for another time. Enjoy a slice of what a 9-year-old in 2010 finds interesting in Jim Henson’s body of work. We think we may go back at some point to fix some sound and get better quality clips. A lot of the clips we not supplied by The Jim Henson Company and look like they came from old VHS copies of programs. Wow, she just asked what’s VHS. Our new friend, Alton Brown, from “Good Eats”, shares some behind the scenes goodness. We see ‘how they do that’. Extra credit if you can name the editing software our video editor is using!